In the last couple of weeks I have had a few questions about how we came to build our little humpy in the bush, so I thought I would lay it all out here is question and answer fashion. If you have more questions, please leave a comment and I will answer them to the best of my ability. Question one; Why did you build a temporary dwelling rather than a house? 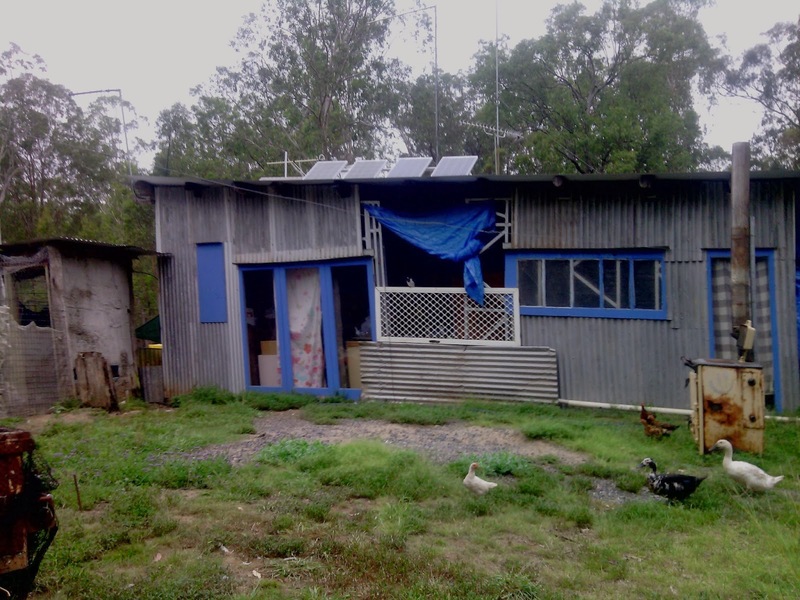 Several reasons; firstly we could not fund the building of a house as we were busily trying to pay off the purchase of the land, secondly because we (well, I really, my partner doesn’t care where he lives) were not sure where on the block would be the best place to build for passive solar and storm protection advantages. Question two: How long did it take to build? The real answer to this one is “Years”, but we build the roof structure, some walls and a lock up area in about three weekends with the help of a borrowed tractor and some ropes (and a chansaw). We are still building the temporary dwelling now, making it more usable and completing little projects that make our life easier. Question three; What is the humpy made from? 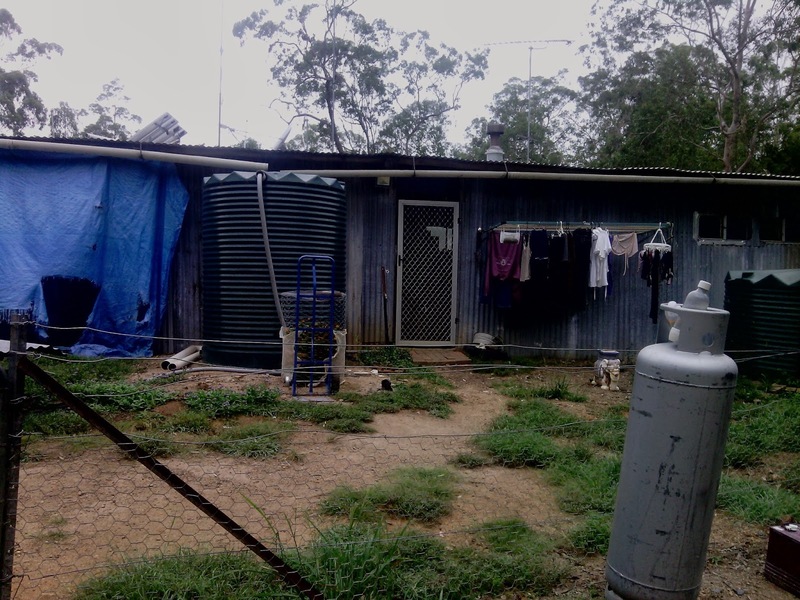 The humpy is made from round poles and corrugated iron. We began the building with cutting down enough trees from our property (of species scorned by white ants) to make 5 metre long poles for the uprights. After these were towed in, debarked (with an axe) and stood in the pre-dug (1 metre) holes, we went out and got more trees for the beams on which the roof is built. On top of these beams we put smaller saplings which we attached the iron to. 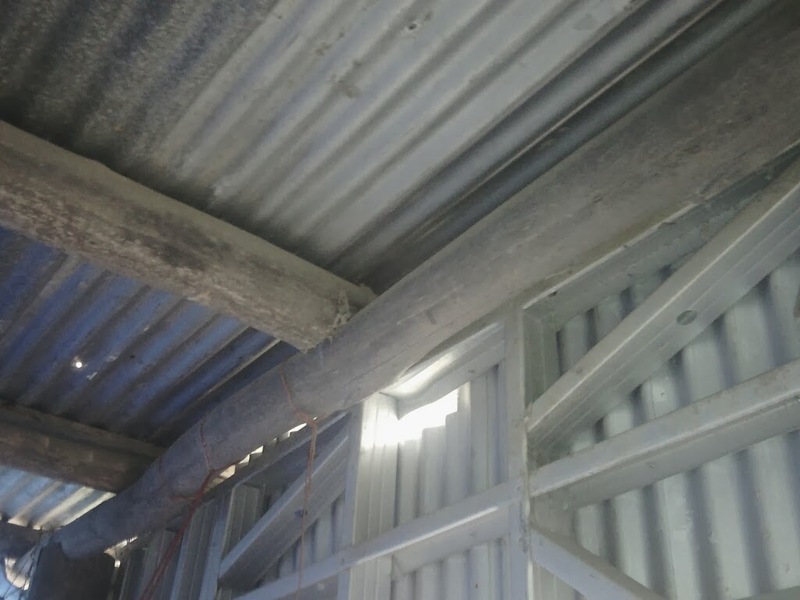 The timbers are held together with metal strapping which allows them to move as they expand and contract and move in the wind. All this was covered by sheets of (nearly) new roofing iron and a gutter made from PVC pipe cut in half was attached. Then we moved the caravan, and ourselves in. 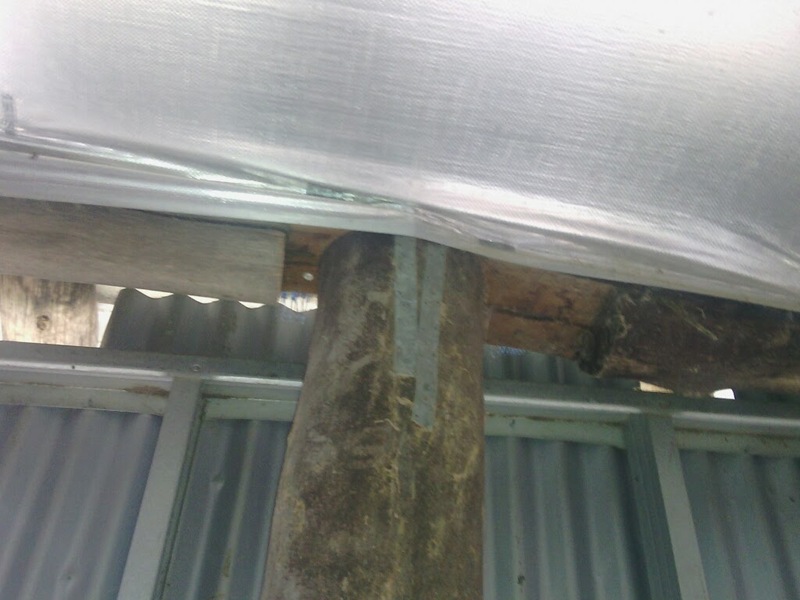 The metal bits on the pole are the strapping, without which the roof would blow off. A shot of the unlined ceiling of the bathroom. It shows how we spaced the saplings on the beams. 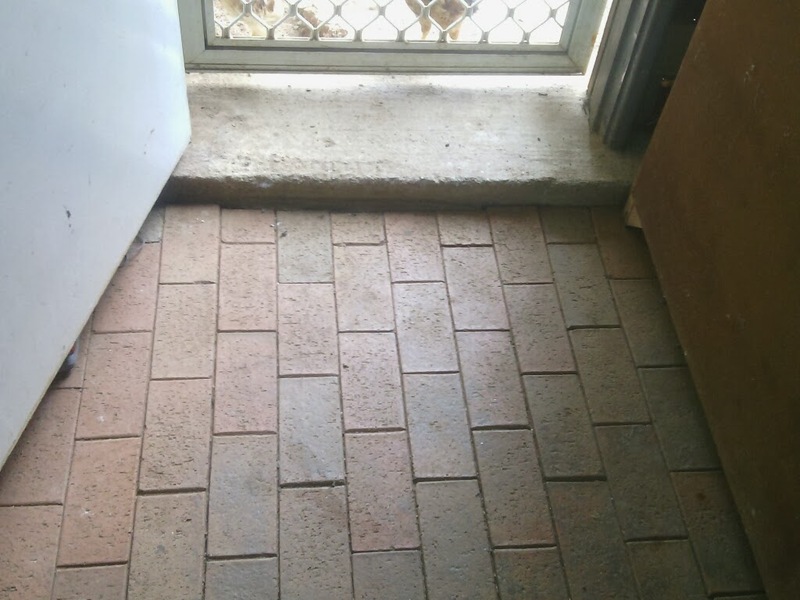 We paved the floor with outdoor pavers (cheap seconds) which gives us a hard, semi-level and (most importantly) sweepable floor. This is the northern view of the humpy. The tarp is covering where the front door will one day be. This is the western view, again this tarp is covering a section of wall not yet completed. I know it all looks a mess (because it is) and Jerry built (because it is), but it is a very strong structure which has been through a lot of wild storms and has been built for a tiny cost from second hand materials. Our home is mostly happy, filled with lots of laughter (and some tears) and most of all is a haven for any creature who needs healing (sometimes human animals too). My house is a mess and always half finished because I have the concentration span of a may fly and the curiosity of a squid, meaning; I want to try everything, and I want to try it all now. ← Desperate times call for desperate measures…or shearing sheep with scissors.